Anyone who visited the Standing Rock Sioux's anti-Dakota Access Pipeline protest encampment in November or December, when newcomers caused the population at the makeshift city to swell to as many as 10,000 people, would be met with a warning from the "water protectors" and other activists who had been there from the beginning: the government is watching you. Now a file of newly leaked documents published by The Intercept confirms what the activists had suspected all along. TigerSwan, a private security firm that has previously worked as a contractor for the United States government, used “military-style counterterrorism measures” to monitor the Sioux’s peaceful and largely prayer-driven protest against the pipeline. TigerSwan’s services were retained by Energy Transfer Partners, a Fortune 500 oil and gas transmission company that is aggressively trying to add new projects such as the Dakota Access Pipeline to its portfolio. The spate of new pipeline projects being built across the United States, all promising inexpensive and more efficient delivery of oil and gas, undermines attempts to halt climate change and locks the United States economy into further dependency on fossil fuels, environmentalists and some lawmakers argue. The Dakota Access Pipeline route in particular falls under a lake that supplies the Standing Rock Sioux with their water and feeds into the Missouri River, raising concerns about contaminating the water supply should the pipeline ever leak. Even now, barely in operation, the Dakota Access Pipeline has already leaked in two spots. Vicki Granado, spokesman for Energy Transfer Partners, responded to news reports about the leaks by distancing the company from the very same contractors they had hired. "They are responsible for the operations, maintenance, etc.," Granado told the news media. For the Standing Rock Sioux, the fight against the Dakota Access Pipeline was both environmental and spiritual, ignited in part by a Sioux legend about a “black snake” that wreaked havoc on sacred land. 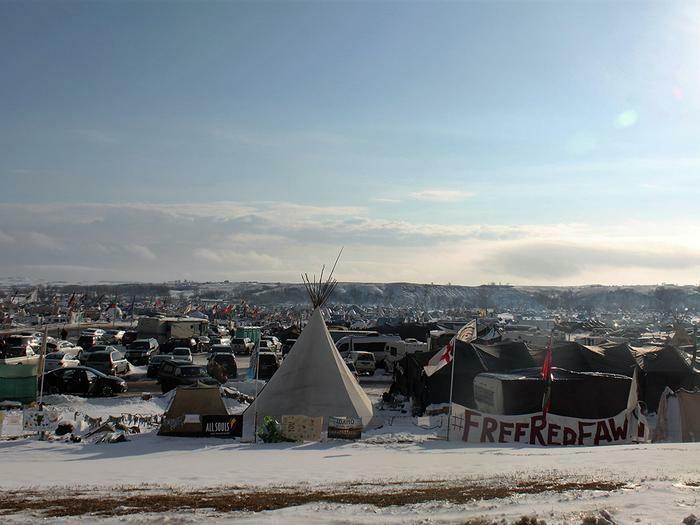 The prayer and resistance encampment that the Standing Rock Sioux began in opposition to the Dakota Access Pipeline last August grew into something bigger than anyone imagined, drawing people from all over the world and American Indians from all nations. The camp, as visitors were told by volunteer security guards and other organizers, should be peaceful and treated as a place of sacred prayer. But for TigerSwan, that combination of religious ideology and protest apparently was reason enough to draw comparisons between the protesters and war-torn Afghanistan. A pick-up truck with no license plates charged toward the larger anti-pipeline camp on October 28, nearly hitting pedestrians who were walking along the road, according to witnesses interviewed afterward. A volunteer guarding Oceti Sakowin, as the camp was called, said he caught a glimpse of an AR-15 inside the plateless truck and unsuccessfully tried to reach his hand inside to grab it. That set off a tense car chase, with at least two protesters going after the truck with their own vehicles. Witnesses later told reporters that one of the protesters, trying to stop the truck from entering camp, purposefully hit it from the side to force the vehicle off the road. Footage then captured shortly after the chase shows a man standing in a lake, wielding an AR-15 rifle and pointing it at people nearby. Another man, dressed in a fur hat, talks to the gun-wielder, and appears to persuade him to back away and to stop pointing the weapon at people. A voice in the background is heard urging someone to call the police. Police with the Bureau of Indian Affairs eventual came and arrested Kyle Thompson, allegedly the driver behind the wheel of the plateless truck and the man seen holding the AR-15. It turned out that Thompson was a security guard, working for a firm hired by Energy Transfer Partners. The BIA turned the case over to the Morton County Sheriff’s Department, which subsequently declined to press charges against Thompson, though he was later charged with domestic violence over a separate incident. Instead, over a month after the truck chase and gun incident, it was Thompson who became the victim in the eyes of law enforcement. The Morton County Sheriff's Department decided to charge the protesters who allegedly ran Thompson off the road with felony reckless endangerment. And Pueblo water protector Brennon Nastacio, the man captured wearing a fur hat and persuading Thompson to stop pointing his AR-15 at people, was charged with felony terrorizing, a federal crime. Thompson had later told police that Nastacio and other protesters caused him to fear for his life that day and that they were armed with knives during the confrontation. It was just one example of the many arrests, crackdowns using "non-lethal force" and other aggressive tactics police used against those taking part in the protest, leading the water protectors to create their own nickname for police of "oil protectors." In response, authorities have denied that they were working in the interest of Energy Transfer Partners. The state of North Dakota even launched a site specifically to dispel this and similar “myths” about the Dakota Access Pipeline, writing that there is no merit to the claim that Morton County received money directly from Energy Transfer Partners to protect company equipment. Public court documents from the law enforcement side have similarly shown that information gathered by Dakota Access Pipeline workers was later used to make arrests of protesters. 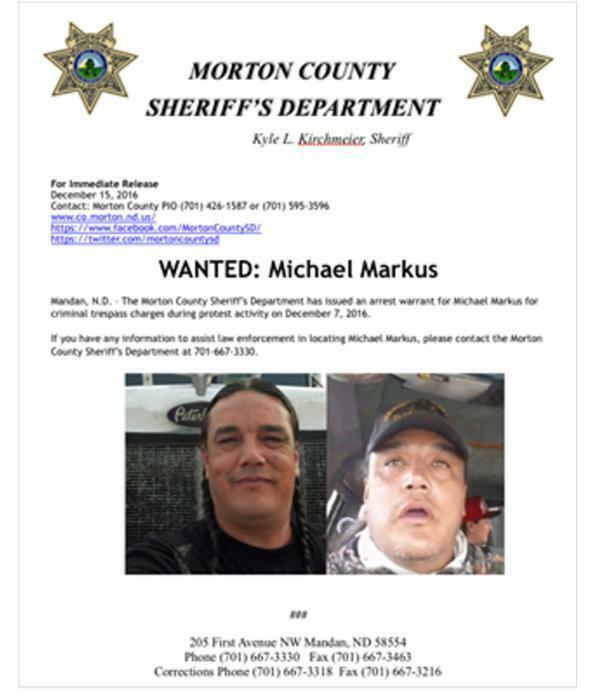 Late last year, the Morton County Sheriff’s Department put out a warrant and a “Wanted” poster for Michael Markus, a water protector known as Rattler, who had a popular Facebook page documenting daily happenings at the camp. The charges that the “Wanted” poster described were vague, and this "Wanted" poster, like the many others that Morton County has published against those taking part in the protest, used photographs taken directly from the suspect's Facebook page. It was a federal affidavit later filed by the Bureau of Tobacco, Firearms and Explosives that laid out the specifics of what Markus was wanted for; he allegedly was part of a group that poured gasoline onto a makeshift barricade and set it on fire to deter law enforcement from raiding the camp in late October. Authorities said they deployed firefighters to put out the blaze. Afterward, the feds apparently received some information from Energy Transfer Partners, who had been monitoring the scene from a private helicopter. “While law enforcement was conducting their operation,” says an affidavit signed by Bureau of Alcohol, Tobacco and Firearms Agent Derek Hill, “a helicopter that was being utilized by the Dakota Access Pipeline was monitoring the situation from the air. A passenger in the helicopter was utilizing a digital camera to document the operation and these digital photos were provided to law enforcement….Upon reviewing the digital photos, I was able to identify several individuals pouring what is believed to be gasoline on the barricades,” Hill writes, with Markus and others allegedly captured in the phtograph and now facing federal charges. Five people in total are currently facing federal charges in relation to the Dakota Access Pipeline protests, with their trial dates pending.